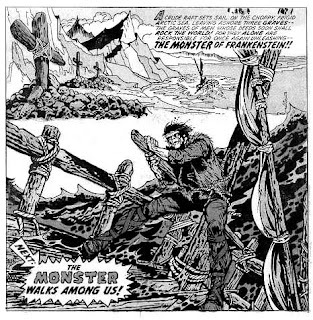 Here's a question, Mary Shelley wrote a wonderful book, Frankenstein, about a monster with a high IQ and emotional turmoil who sailed away on an iceberg, but then what happened? Frankenstein's monster was created out of pieces of dead bodies that were reanimated through electrical current. My question is what long term effect does that have on him? Is he stuck in the state of his initial reanimation so that he does not age or grow? Do the dead body pieces continue decomposing without him actually aging? Does he ever need to be recharged? Will he live forever in that frozen state (ha, no pun intended)? Her story seems to suggest that he will far outlive all those around him, possibly living eternally. However, being the first of his kind should suggest that neither Mary nor Frankenstein's monster should know the answer to that. The procedure was kind of a breakthrough in science and those don't always play out like the scientists expect. Though Mary seems to suggest an eternal state I am not sure I can agree with that. If Frankenstein reanimated once living tissue cells, cells that are programmed to age, reproduce and die, I think I lean towards either decomposition or an unnatural aging cycle. I don't hold with the camp of a frozen state. However, since I have never heard this particular issue debated before, I don't know if any of the sides have specific camps. I don't know the answer to your question, but I can say without doubt that some day I'm going to use this as a thought experiment in a philosophy paper and that it will be mind-blowing. So thanks.